Let's first look at Pluto to understand my reasoning behind similarities and differences in the radiation pattern design of the LXmini. 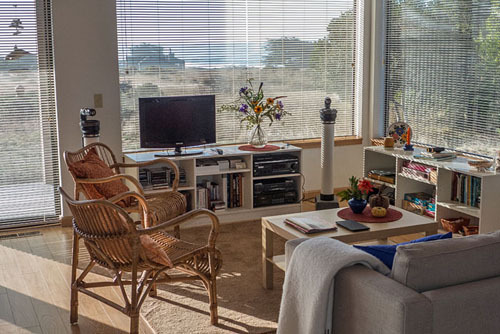 The tweeters of the PLUTO speakers in this picture are 18 inch (0.46 m) in front of the wall and window. The right speaker is placed 36 inch (0.92 m) from the side window. For best imaging the speakers must be moved 36 inch (0.92 m) away from the wall/window behind them, but this does not fit with the decor. PLUTO is essentially omni-directional up to about 3 kHz. At higher frequencies the 2" tweeter becomes ever more forward firing. I postulate that if less of the large reflecting surface behind the speakers is illuminated with sound, then the stereo imaging will also be less affected. Thus to be less placement sensitive a loudspeaker should minimize radiation to the rear and be forward directional. A physically small loudspeaker has limited air volume displacement capability, which determines how much low frequency sound pressure can be generated. PLUTO has struck a nice balance between size and bass output. PLUTO is an acoustic point source, a monopole, at low frequencies, illuminating the room in all directions equally. At least the center of the source is at ear height for a seated listener and bass is not reinforced by the floor, but immediate surroundings will have some effect, if they are close. That is unavoidable. 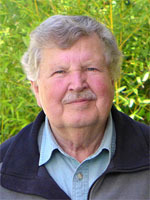 If a dipole point source is added to a monopole then unidirectionl or cardioid radiation is obtained when both sources contribute equally to the total sound. Here I use a 700 Hz LR2 crossover between monopole and dipole. 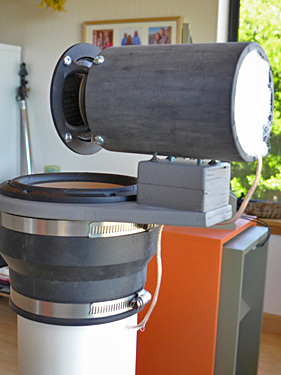 The dipole consists of a small full-range driver mounted above the woofer section. Due to the transition from monopole to dipole radiator the cardioid polar response is only obtained around the crossover frequency. At higher frequencies the dipole radiates equally well to the rear as to the front. The rear radiation from the dipole must be attenuated or scattered and diffused in order to minimize the influence of a large reflecting surface behind the dipole radiator. The cylindrical body behind the dipole driver serves that purpose as its dimensions are in the fractional wavelength range of the frequencies concerned. There is a small gap between the magnet and the inside of the pipe. The rear is open and stuffed with absorbent material for very high frequency attenuation. The resulting polar response in the horizontal plane is shown below. The response in the vertical plane should be similar, because of closeness of the acoustically small sources. 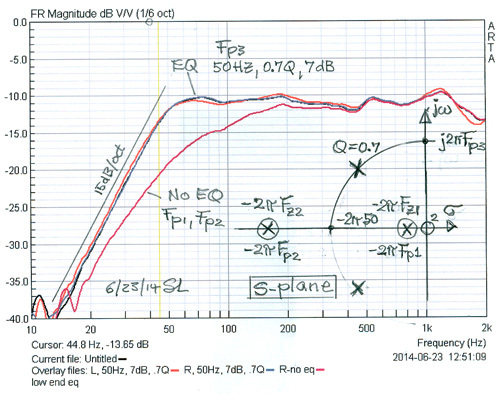 Thus a listener's ears should be on the dipole axis. Standing upright close to the speakers definitely darkens the timbre. 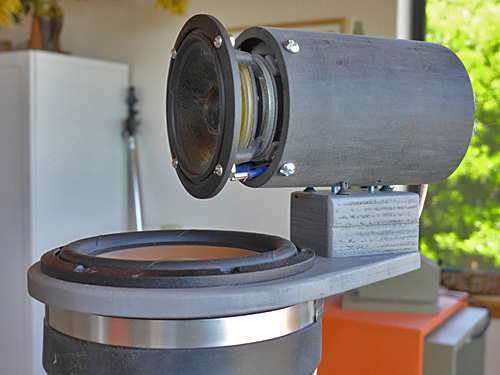 At 180 degree in the rear, the speaker has a small bright spot between 1.2 kHz and 6 kHz. I have not noticed anything audible. Toe-in of the speakers should throw any specular reflection off to the sides. The resulting polar response of the LXmini is omni-directional at low frequencies. It is an acoustic point source because the woofer driver and the pipe end are small compared to the radiated wavelength. The radiating surfaces of woofer and fullrange are at right angle to each other so frequency-modulation (Doppler) distortion is very low, unlike that of a coaxial driver arrangement. The radiator remains acoustically small through the crossover frequency range, where woofer and open baffle tweeter form a cardioid polar pattern around the tweeter axis. In the tweeter frequency range the radiation is dipolar, but with the rear radiation dispersed irregularly and gradually attenuated with increasing frequency. The pattern is formed by coaxial monopole and dipole sources. Thus the power response starts out at 0 dB for low frequencies and decreases by 4.8 dB for cardioid and dipole ranges and decreases further in the kHz range, but not as much as for the typical 2-way box speaker. The timbre of the reverberated sound field changes smoothly with frequency. Tonal neutrality, clarity and stereo imaging of the LXmini are truly exceptional. The woofer sits at the top of a sealed pipe, which is so heavily stuffed with absorbent material that the two poles of the woofer highpass become real and roll-off is at less than 12 dB/oct. The stuffing attenuates higher frequency pipe resonances and stiffens the restoring force to the driver. The driver cone undergoes large displacements, the electro-mechanical structure is non-linear and the large amount of mechanical damping is thought to stabilize the response. The two real axis poles above and below Fb are compensated by two zeros so that the complex pole pair determines the roll-off characteristic. Equalization is done empirically with the DSP. The actual roll-off rate is 15 dB/oct, which is close enough to a 12 dB/oct theoretical behavior. 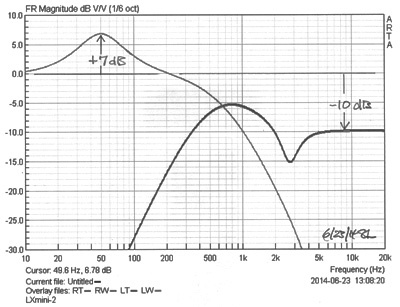 Equalization is achieved by a 7 dB peak in the frequency response of the DSP. This form of equalization is advantageous because the response drops below 50 Hz towards 0 dB, thus relieving the driver somewhat of excessive excursions below the peak frequency. 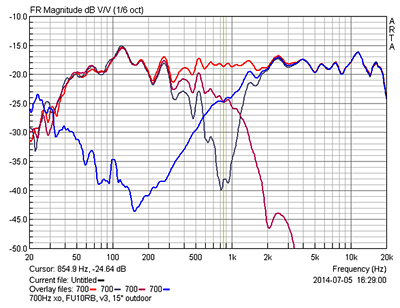 The equalized woofer response is 3 dB down at 45 Hz. The power amplifier requires 900 mVrms or 2.54 Vpp input voltage for 80 W output. This input voltage is also the output limit for the DSP DAC. The corresponding 50 Hz input signal to the ADC is 7 dB lower or 1.13 Vpp. 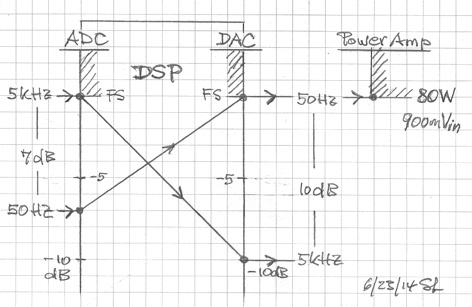 This is 7 dB below the 2.54 Vpp input limit of the ADC. A (2.54 - 1.13) = 1.41 Vpp sinewave at 5 kHz could be riding on top of the 1.13 Vpp, 50 Hz sinewave, when the ADC input and the woofer DAC clip. The 1.41 Vpp, 5 kHz sinewave signal would produces a 16 W output for the dipole fullrange, if the tweeter channel had 0 dB gain. At -10 dB of gain the output is merely 1.6 W. A single 5 kHz sinewave at the clipping level of the ADC would deliver 8 W to the fullrange. The spectrum between 50 Hz and 10 kHz is evenly divided on an octave basis by a 700 Hz crossover. Having 5 dB to 10 dB less peak signal capability for the upper frequency range is of some concern to me. Putting 10 dB of gain between DSP and power amplifier would make full use of the amplifier's capability and raise the noise floor, which is of little concern. But after many hours of listening to the LXmini I have only run into the expected woofer driver excursion limitation. So I am happy. The drivers are the limiting elements and not the electronics. The range of the miniDSP 2x4 input ADC is set to 0.9 Vrms by default. It can be increased to 2 Vrms by resetting two internal jumpers in case a multi-channel volume control is used downstream of the miniDSP 2x4. The LR2 crossover results in wide overlap between drivers from 300 Hz to 2 kHz, and they combine as two point sources, being acoustically small. The electrical LR2 crossover filters are set to 700 Hz, but the resulting acoustical crossover -6 dB frequency is at 855 Hz due to the underlying equalization of each driver. Tweeter channel delay is only 60 microseconds (21 mm). The tweeter has no baffle and sees the woofer essentially in the radiation null. The deep and wide shape of the interference notch, when the polarity of one driver is reversed, and the driver roll-offs, are indicative of the well behaved vector addition of woofer and tweeter outputs when the normal polarity is in play. 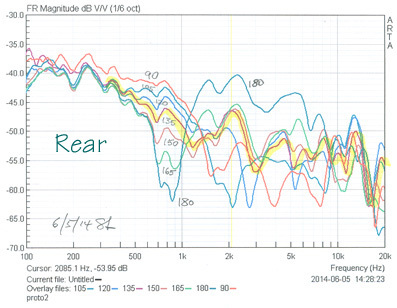 The on-axis frequency response extends to 20 kHz after equalization. The full-range driver cone operates in break-up mode. I rely on the proven consistency of SEAS drivers to be confident that my speaker design results are transferable. Ripples in the measured response below 1 kHz are due to nearby reflecting objects. 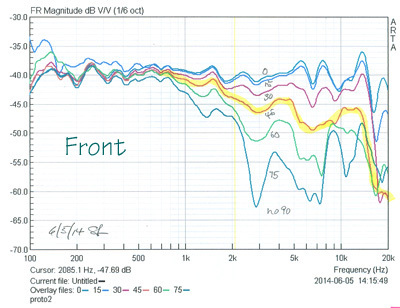 Interfering low frequency wind noise is seen in the cut-off region of the tweeter. Please do it according to my Construction Plans. I have observed that not only beginners but also experienced loudspeaker builders lack an appreciation of acoustic field design and consider a flat and extended on-axis frequency response as the ultimate goal. (It is a necessary, but not a sufficient condition) With a DSP unit in the system it is almost trivial to obtain a flat response at one point in space, whether under free-field or in-room conditions. But sound propagates in 3D directions and returns to your ears as reflection to be processed by your brain together with the direct sound from the speaker. The LXmini is designed as a transducer, from electrical voltage IN to 3D acoustic radiation OUT. The most important elements in the design are the drivers and the pipes to which they are mounted and their relative arrangement. Look at it as a two cylinder/piston electro-acoustic motor. It is a machine, not a piece of furniture, and it has a beauty in its lines and simplicity of execution. It is a machine where moving or changing mechanical elements will change its behavior to varying degree. Do not ask me about the audibility of a change. Do it and compare it to the LXmini as designed to find out whether it was worthwhile. You may be tempted to add subwoofers. That is an expensive proposition and you should really consider the LX521 instead. The whole point about the LXmini is its small size, easy placement, simplicity of construction and low budget, while delivering reference quality sound, albeit with some restrictions at the low end, mainly for organ or disco types of music. Whatever you do have fun and enjoy the music!